Heat oven to 150C and line 6 muffin tin holes with paper cases. Melt butter, stir in the biscuit crumbs until combines and press firmly into the bottom of the 6 cases. Chill while you make the filling. Beat the ricotta cheese with the icing sugar, lemon zest and juice, whole egg and egg yolk and vanilla. In another bowl, whisk the cream until it just starts to thicken and peak and gently stir into cheese mixture. Spoon into the paper cases on top of the biscuit base, right up to the tops. 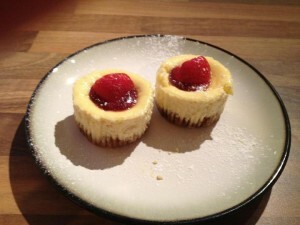 Top each cheesecake with 1 tsp strawberry jam and half a strawberry. To make it easier to remove them from the paper cases, I chill them in the fridge for 30 mins as well. These are wonderful for parties/dinner parties as you can make them a lot earlier and pop them in the fridge until you are ready.